I just got out of the shower and slipped on a memory. It’s my hot weather post-subway ritual, to cool my skin by taking a shower with Dr. Bronner’s peppermint soap and then, while still just a bit damp, wrap myself in this yukata. For five minutes, maybe ten, I feel not only cool but also serene. I cross the bridge from the work day to my truer life. On the other side of the day, before we’d ended up at the Oriental Bazaar, we’d visited the Meiji shrine. In my memory, I see the cool silvery-brown of the Torii and can almost feel my fingers touching the wood. I see an elegant minimalism, nature respectfully tamed by light and empty spaces. A family, the women dressed in elaborate kimono, bringing a new born child. 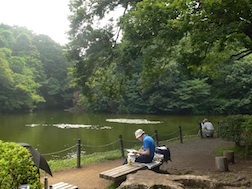 And in the park, the iris garden, tortoises in a pond, and a man making his own calm in watercolour. That same day began with my friends and I waking up on our futons in the hotel in Itzukogen. On the way to the train, we bought hot coffee in cans at the station shop, a shop that carried everything from dried fish to Hello Kitty keychains. Next door was the little bakery where we had not yet figured out which pastry was filled with what, but that was fine with us. We sat in the train, sipping from our cans and eating our pastries, until we got to Atami where we could switch from the spur line to the Tokyo train. We made this trip for six days, because wherever we wanted to go, we always had to change at Atami. On this day, the second trip, we already felt experienced and were emboldened to walked the market for the first time and stare eagerly at everything that was on offer. I try, but can’t remember if this was the same day we bought the white peaches that came individually wrapped in tissue paper. This is why we call them “souvenirs”, those things we bring back from trips. It almost doesn’t matter what they are, but the best souvenirs are the things we actually use because in handling them, we go back to the time and place when we first picked them up and we remember. Maybe it’s the effect of coming off a holiday weekend, but I decided this month’s 4 F post would, after all, be about food. And maybe because it was specifically July 4th weekend, my most satisfying moments were with some very simple American foods. No, not hot dogs, potato salad and the berries + whipped cream flag cake. I live in an urban neighborhood and three blocks from the firehouse, so outdoor grilling is out of the question. And to my mind, the only excuse for the flag cake is that it follows a pile of barbecue or a sandpit clambake, so it’s a decoration and not a dessert. Come to think of it, the dishes that seemed so right to me this weekend were almost equivalents for that barbecue and clambake, and the dessert might not have been wearing bunting but it had an American soul. Usually it’s all I can do to get to the end of a Friday at work. By the time I get on the subway, all I want is to have a glass of wine, eat some dinner and throw myself in front of the most escapist offering I can hunt up with the remote (making a decision about watching a specific video would be too much effort!). This weekend, just knowing that there were three days ahead of me gave me a sudden surge of Friday energy. I called The Mom and suggested she run out and pick up some soft shell crabs for dinner. Then at lunchtime, I ran out to Chelsea Market (where I spend far too many lunch hours), to hit the Manhattan Fruit Exchange. That shop itself is a source of much simple satisfaction. It boasts a dazzling variety of produce (the mushroom section alone sets me dreaming) as well as most of what you need to round out your dish after the unexpected item has called out “buy me NOW!” Because it was the start of a holiday weekend, there were more than the usual number of foodie safaris in the market, and I had to do some nimble navigation to get to my rhubarb. It was crazy enough there that I actually forgot to get a tomato, which I later wished I had. The recipe I was focused on was the Lemon Buttermilk Rhubarb Bundt Cake from Rustic Fruit Desserts, by Corey Schreiber and Julie Richardson of Portland OR’s Baker & Spice (book is available all over, but I like to promote Jessica’s Biscuit whenever I can; they “simply” specialize in cookbooks and always have — even before we started doing all our shopping on The Internets). Like all the recipes in the book, this cake is about showcasing the fresh, honest flavors of seasonal fruit. There was nothing remotely complicated about it, other than the usual challenge of prep work in a kitchen that has no counter space (remember that kitchen in Julie & Julia? consider it typical). I popped the cake in the oven to bake, and after doing enough of the washing up to have a sink again (not only is it small, but the kitchen is also in an old apartment building that is not set up for dishwashers), I sautéed the crabs for a favorite seasonal dinner of mine — the soft-shell crab sandwich. This is a superb dead-easy urban picnic dish. It takes less than 10 minutes. Dredge the crabs in a seasoned mixture of flour and cornmeal, then sauté in olive oil while you toast some hamburger buns. If you like, after you’ve turned the crabs you can add some white wine or even water (just a few tablespoons), a squeeze of lemon, a few splats of Tabasco and a pat of butter, all of which creates a little faux sauce to keep the little critters moist. If you’re going deluxe, use homemade rolls. My own failsafe is a roll I’ve been baking out of Bobby Flay’s Bold American Food for as long as…well, apparently since 1994, which seems to be when that book first came out; make them plum-sized to use as dinner rolls, but make them the size of oranges and you’ve got a great sandwich bun. They freeze beautifully. Since I had no big ones in the freezer, it was store bought burger buns for me this weekend, which was fine. And definitely store bought mayo (you need that level of emulsification to hold up against the sautéed crabs). Now, in a better world, I’d have remembered that tomato. And in a perfect world I’d have planned ahead and made some potato salad and jicama slaw. This being imperfect and somewhat improvised, i just used up the basil I had in the refrigerator and, when the crabs were out of the pan, gave a quick stir to some asparagus that was also pushing it’s luck. And you know what? Even without a ripe red slice of tomato, it was a very happy sandwich. Crunchy crabs, lathered in mayo and wrapped in a nice sweet roll, and just a touch of something garden-y. Mmmmmm! Since a crab sandwich is a drippy thing, you get to lick your fingers and it truly feels like a picnic, no matter where you are. By the time we’d finished eating, the cake was ready to cool in the pan. Following directions, half an hour later I removed the pan and drizzled on the lemon-&-sugar glaze. A perfect amount of time had passed in which to digest the meal and be ready for coffee and the cake. The cake was a joy; buttery, lemony and delectable. A toothsome crumb, just rich enough for the tongue, and yet amazingly light. I say amazingly because no eggs were separated to make this cake, which does use a full cup of butter plus has buttermilk as the liquid (helpful hint for any bakers who haven’t yet caught on — King Arthur sells an excellent powdered buttermilk; keep it on hand as I do and you’ll always be only 20 minutes away from warm soda bread or scones!) It’s a cake that can easily serve 10 – 12, so it’s a good thing for me that it keeps tasting great for several days. It may have helped matters that I suddenly remembered my old Tupperware “cake saver” (they now offer an updated model), one of many designs of simple genius from a brand that, suitably for this story, also screams “American” to me. Saturday was, s those in the same zone will know, a gorgeous summer day. I decided to take advantage of the weather and indulge in another of my lifestyle diversions — raiding the final markdowns. This is a ritual that can be observed twice a year. At the end of the seasonal sales, after the department stores have reached a certain plateau in selling down their leftover merchandise, it’s time for my favorite words: “take another 30% off” (more or less). This is my semi-annual chance to possibly acquire clothing from designers whose labels would otherwise hang only in my fantasies. Shopping this way is for gatherers, rather than hunters: you can’t go out with expectations; you forage for what you can find. I had a lucky day and gathered up some wonderful buys — simple (yes, I said it again), classic and entirely satisfying garments I’ll be happily wearing for years. After a shopping binge, my adrenalin rush insists on being fed. Since I was in the neighborhood, I decided to stop by Todd English’s Plaza Food Hall for a bite. I could call this the “hunting” portion of the day as it was my second time there in as many weeks, and I was going there purposefully in search of one thing — the prime rib sliders. Nothing intricate — perfect ingredients prepared with exquisite care. Three oblong buns, slightly soft and slightly sweet. A touch of fontina and onion. All in discreet support of moist, flavorful shavings of prime rib that melted into the mouth with every bite. Accompanied by a pour of extremely pleasant grenache, this made for a soul-satisfying urban “barbecue”. When I think about it, the only thing I missed this weekend was corn on the cob. On the other hand…there’s still that one last sliver of cake. 2 Anniversaries, 2 Kindle Countdowns!